Eeee by eck. We’ve a couple of days off from that nasty four letter word so we’ve come up to the North Yorkshire Dales (t’yorkshire) for some extreme dog walking. Land of flat caps, whippets (we brought a Lurcher along) and tight-fisted Yorkshire folk. This is Emmerdale farm country. No it really is, the next village along, less than 2 miles away, is the site of the original pub in Emmerdale, The Woolpack. To further enhance an authentic experience, we’ve stopped in a bothy on small holding via AirBnB. Greeted by the sound of a cockerel in the morning, we open the window to be greeted by donkeys, goats,chickens and alpacas immediately outside. A tolerance for country air is handy at this time. But we’re not here for Emmerdale, we’ve come to get away from people and we’re off extreme dog walking and to explore around Malhamdale and the Yorkshire Dales starting with Malham Cove. We’ve headed down some unfeasibly narrow single track roads that have made me think twice about buying a larger sized campervan to arrive to a most unwelcome sight. Thousand of cars spilling out of the car park and lined on the side of the road. We’ve made the mistake of going somewhere at the weekend to a very popular tourist spot. I could kick myself, now I feel more like a Yorkshire pudding than Yorkshire Dales. Malham Cove is swarming with selfie obsessed and screaming kids. Its jam packed with people in Hunter wellies and kids in John Deere tractor onesies We’ve got a nervous dog with the shakes so bad that we’ve got no chance of getting to the top of Malham Cove so head off to Ribblehead Viaduct. The dales are bleak, lonely and foreboding. Over a hundred navvies dies constructing Ribblehead viaduct and I’m sure my dog can sniff the spectral echoes that linger on the moor. To be fair, we’ve got here late, I’m pretty sure I’ve just heard the howl of an American Werewolf and the pub we passed looks more like the Slaughtered Lamb. 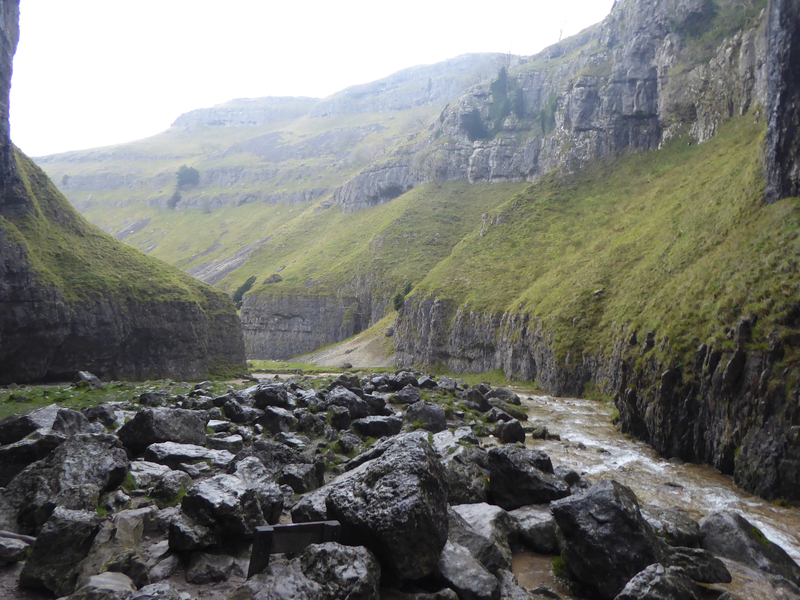 The next day we head back to Malham, this time though, its Monday morning and relatively deserted. 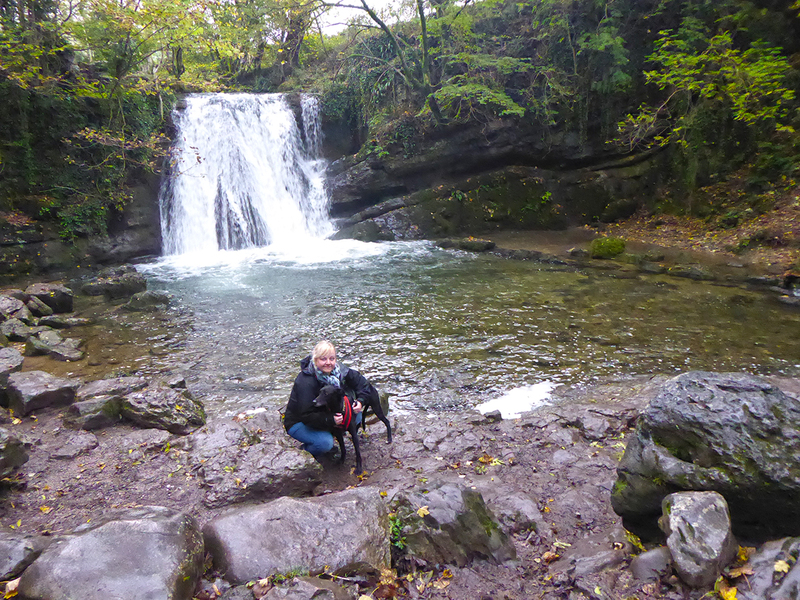 Janet’s Foss is a beautiful waterfall in a secluded woodland spot. Supposedly named after the local fairy queen that lives in the cave behind the waterfall. Foss is the Norse word for waterfall and while Janet’s Foss may not match Gullfoss, it is certainly scenic with a magical woodland feel. 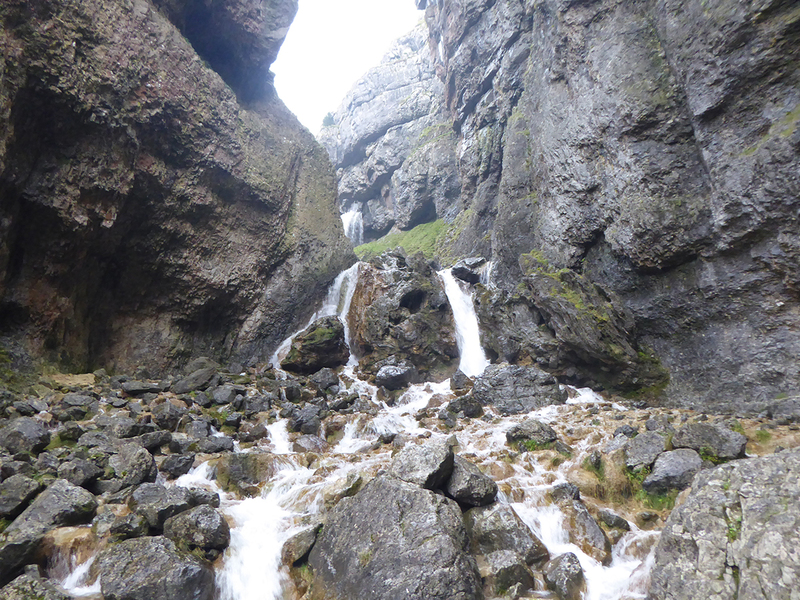 Across the road we head to Goredale Scar, a geologists dream with a huge chasm of overhanging rocks and a crashing waterfall that echoes around the gorge. Glacial melt-water has scoured away at the rock to produce this stunning limestone chamber and puts Malham Cove to shame. 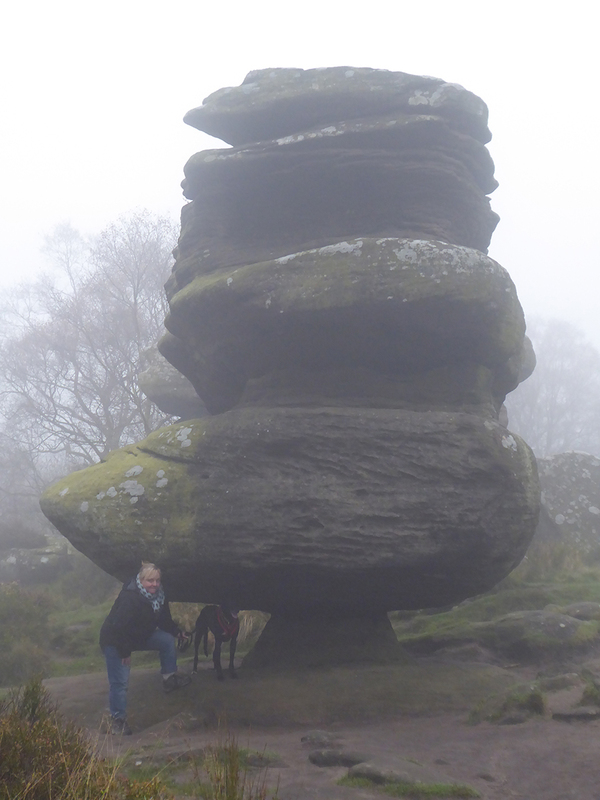 A rather foggy sleepy hollow atmosphere at Brimham Rocks. The last stop on our trip in t’Yorkshire is to Brimham Rocks. The weather has turned a rather foggy and its en eerie sleepy hollow atmosphere as we wander around the rocks and wonder whether we are lost or not because we can’t see more than 50 feet in front of us. What we can see up close is millstone grit worn smooth by 320 million years of erosion from ice, wind and thousands of kids feet to produce weird shaped rocks.